Recent actions carried out in Bolivia by Brazil‘s two most powerful prison gangs indicate these groups are looking to deepen their presence in the Andean nation as part of a wider struggle to gain control of the regional drug trade. Three alleged members of the Red Command were arrested on April 25 in the city of Cobija, which lies along Bolivia‘s northwestern border with Brazil, reported La Razón. The suspects are accused of attempting to kidnap a family in Cobija in order to receive a ransom payment. One of the detainees is a Brazilian national and the other two are Bolivian. Two additional Red Command members are believed to have fled into Brazil. Shortly after the arrests, Bolivian Interior Minister Carlos Romero said the Red Command and its arch rival, the First Capital Command (Primeiro Comando da Capital – PCC), are “spreading out” in Bolivia in order to carry out robberies and “continue carrying out actions aimed at monopolizing the control of drugs,” reported El Deber. Romero added that four recent criminal acts have been attributed to either the PCC or Red Command, including the theft of $1.3 million from an armored vehicle in late March. 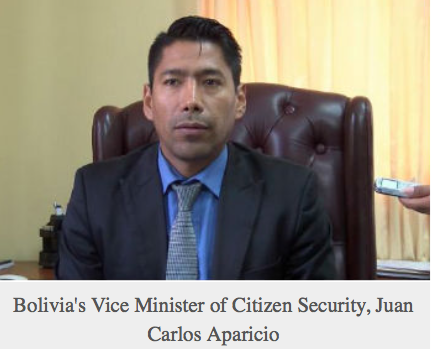 For his part, Bolivian Vice Minister of Citizen Security Juan Carlos Aparicio said that while the Brazilian prison gangs have “emissaries” in Bolivia, their presence is only “sporadic,” reported La Razón. “There are no cartels in the country,” he added. Once allies, the PCC and the Red Command are now jostling for control of drug markets in Brazil, a massive consumer of cocaine, marijuana and a type of crack cocaine known in Spanish as “basuco.” Setting up operations in Bolivia — the principal supplier of basuco to Brazil — is an attractive option for the gangs as it would enable them to cut out the middlemen and thus increase their profits. The gangs have already used this logic to either expand or attempt to expand their influence in Paraguay, South America’s largest marijuana producer, and Colombia, the world’s largest supplier of cocaine. The extent of the Brazilian gang presence in Paraguay became evident with the recent multimillion-dollar heist in the border town of Ciudad del Este by 50 to 60 armed men suspected of belonging to the PCC. In Colombia, Defense Minister Luis Carlos Villegas has said the PCC is seeking to recruit dissident elements of the demobilizing rebel group Revolutionary Armed Forces of Colombia (Fuerzas Armadas Revolucionarias de Colombia – FARC) as well as move into Colombian territory. Ever since the coca grower entered into politics and became president of Bolivia, while maintaining the Presidency of the Coca Growers’ Federations, we have witnessed an unprecedented escalation in crime and violence nationwide. Narcotrafficking is blooming while anarchy is rampant, thanks to this “caudillo” … enough! This entry was posted in Bolivia, Crime and Violence, Drug war - narcotraffick, Politics, Social Unrest and tagged anarchy, cocaine paste, cocaine production, corruption in public office, demagogue, democracy in peril, drug cartels. Bookmark the permalink.